Human-rights abuses, war in Yemen and the killing of a Saudi journalist have strained the West’s relationship with Saudi Arabia over the past year – but throughout it all, Canada’s $15-billion arms deal with the kingdom has stayed intact, despite mounting political pressure on the Trudeau government to scuttle it. On Dec. 16, Prime Minister Justin Trudeau sent his strongest signal yet on the controversial deal, telling CTV’s Question Period the government is looking for a way to end shipments of armoured vehicles to Saudi Arabia. But Canada’s former envoy to Saudi Arabia, Dennis Horak – who was expelled from the Middle Eastern nation this summer amid escalating tensions with Canada – says stopping shipments would be a futile gesture that would only hurt the Canadian economy. Here is some backstory on the conflicts and intrigue of recent months, including some of The Globe and Mail’s key investigations of the issues behind them. How important of a trade partner is Saudi Arabia? When you look at Canada’s top trading partners by total trade volume (exports plus imports), Saudi Arabia comes in as the 17th largest trade partner. Most of what Canada sells to Saudi Arabia is military goods and technology. Not surprisingly, oil constitutes the majority of the Islamic Kingdom’s exports to Canada, though it makes up for less than 10 per cent of total imports and amounts to a drop in the bucket compared with the United States, which accounts for two-thirds of imports and could easily cover Saudi’s share thanks to growing domestic production. In the past, Canada has sold the Saudis military equipment for defence against possible attacks by either Islamic State or Riyadh’s Shia Muslim rival, Iran. But Saudi Arabia has long faced criticism from governments and human-rights activists for crackdowns on dissidents and the country’s Shia Muslim minority. That criticism was still simmering when the Trudeau government took office in 2015, but under then foreign affairs minister Stéphane Dion, Ottawa began approving export permits for the vehicles anyway. The government also faced mounting criticism as evidence emerged that Canadian-made vehicles were being used in the Saudi proxy war in neighbouring Yemen (more on that below), and even against Saudi citizens within Saudi Arabia. In 2014, the Harper government struck a $15-billion deal to sell military vehicles to Saudi Arabia. General Dynamics Land Systems Canada won the 15-year contract. They employ about 3,000 people in Canada, mostly in London, Ont., where the General Dynamics plant is located. The light-armoured vehicles, or LAVs, are equipped with machine guns, medium- or high-calibre weapons or even big-barrel guns that can fire 105mm shells or anti-tank missiles. Saudi-Canadian relations soured quickly last August, ostensibly arose because of this tweet issued by Canada’s Global Affairs Ministry. It decried the arrest and detention of two female bloggers and activists, and urging Saudi authorities to immediately free the two women. Samar Badawi is the sister of blogger Raif Badawi, who was arrested in 2012 and sentenced to lashings and prison time for his criticism of Saudi clerics. While Mr. Badawi is not a Canadian citizen, his wife, Ensaf Haidar, recently became one. She and her children, who live in Quebec, have long advocated Ottawa and other nations to help free her husband. Tourism: In August, Saudi Arabian Airlines suspended flights to and from Canada. The state airline had operated at least two routes flying from Toronto. Health care: Hundreds of Saudi medical students and graduates in Canada were ordered to return home, their grants discontinued. Hospitals who depended on those students scrambled to manage services with fewer staff. Agriculture: Saudi Arabia’s main state wheat buying agency stopped buying Canadian wheat and barley in its international tenders. According to Statistics Canada, Canadian wheat sales to Saudi Arabia were 66,000 tonnes in 2017 and 68,250 tonnes in 2016. 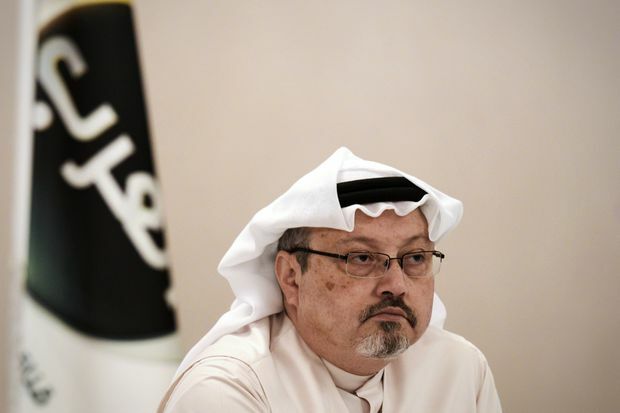 On Oct. 2, 2018, Canada’s ties with Riyadh were strained further by the killing of journalist Jamal Khashoggi, who went into the Saudi consulate in Istanbul seeking a visa for his wife, but never came out. Grisly details emerged from Turkish investigators about how a team of Saudis interrogated, tortured and killed Mr. Khashoggi, a prominent critic of the Crown Prince. Eventually Riyadh arrested 15 Saudi nationals and charged them with the killing, but they deny the Crown Prince ordered it, as U.S. intelligence officials allege. In November, the U.S. and Canadian governments targeted 17 Saudi nationals the 15-person kill team, a former top aide to the Crown Prince and the Saudi consul-general in Turkey – with sanctions under the countries' Magnitsky human-rights laws. The Trudeau government has stopped short of accusing the Crown Prince of being behind the killings, though it has not gone quite as far as U.S. President Donald Trump, who at one point suggested that “rouge killers” may have been responsible. Dec. 10, 2018: Houthi militants patrol a street where pro-Houthi protesters demonstrated against the Saudi-led coalition in Hodeidah, Yemen. Since 2015, Saudi Arabia’s neighbour Yemen has been devastated by civil war between the Houthi rebels and the ousted government of Abd-Rabbu Mansour Hadi. The conflict is effectively a proxy war between Riyadh, whose coalition is seeking to restore Mr. Hadi to power, and Iran, which is aligned with the Houthis. A truce late last year in the port city of Hodeidah has offered some hope for a resolution of the conflict, but the situation in Yemen is still grim. War, widespread famine and refugee displacement have created a humanitarian crisis in what was already the Arab world’s most impoverished country. And Canadian-made vehicles may have played a part in it: Some of the vehicles have been used in active combat against the Houthi rebels, Globe investigations have revealed. The United States has supported its ally Saudi Arabia in the Yemen war, but the Khashoggi killing has turned American legislators against the conflict. Defying Mr. Trump, senators voted in November to move forward with legislation calling for an end to U.S. involvement in the conflict. The vote showed a significant number of Republicans were willing to break with Mr. Trump to express their deep dissatisfaction with Saudi Arabia.